A Sri Lankan air force jet has crashed near the capital, Colombo, but the pilot managed to bail out, officials said. 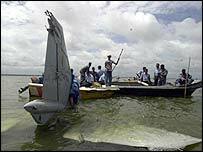 The Russian-made MiG-27 plunged into a lagoon near Colombo's international airport shortly after take-off. A similar jet crashed after take-off three years ago, killing its pilot and injuring seven people on the ground. The pilot in the latest crash had reported some unusual vibrations in the plane after take-off, reports said. Despite attempts to turn back, the jet crashed about 30km (20 miles) north of the capital. The Sri Lankan air force has only carried out training missions since the government and the Tamil Tiger rebels agreed a truce two years ago. Colombo airport and its military base were attacked by the rebels in July 2001. Four civilian jets and eight military aircraft were destroyed.